Below is another update on the upper Salmon River chinook fishery, which is currently open above Valley Creek upstream to the posted boundary at Sawtooth Hatchery. Through the past weekend (7/9), effort remained low, and no fish were documented in the creel (see table), but some fish have been caught this week (more on that below). 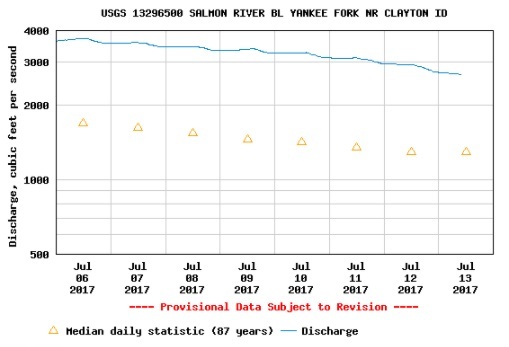 The Upper Salmon river has dropped ~1,000 cfs since last weeks’ update, but as before, river conditions still remain higher than normal, and we’ll likely persist this way throughout the duration of the upper Salmon River Chinook fishery. The river is fishable and fish are starting to show up at both the hatchery and in the creel surveys. The estimate of Sawtooth Hatchery Chinook over Bonneville Dam remains at 2,560 fish, and likely won’t change from here on out. The number over Lower Granite Dam bumped up to 1,645 as we see fish continuing to work their way upriver. Conversion between dams of Sawtooth adult Chinook migrating through the Columbia and lower Snake remains a bit below average (67% vs. 83%), but has increased a little from the last report as we’ve had a few additional PIT tagged fish cross LGD. Based on that, our harvest share is currently 325 fish. 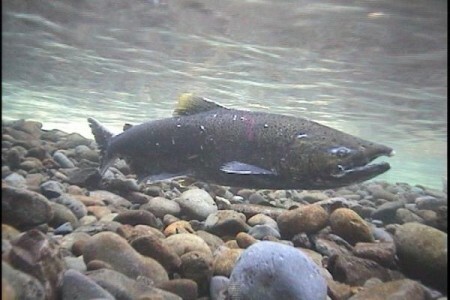 In addition to the adult return, there is a good number of jacks forecasted to return to Sawtooth as well – currently there are 1,328 jack Chinook Salmon over LGD headed to Sawtooth. In addition to fish showing up the Sawtooth Hatchery trap, creel clerks also documented 5 fish being caught earlier this week. Those numbers will show up in next weeks’ creel report, along with the others caught the rest of this week/weekend. Now is the time, so best of luck to those of you able to get out on the water! !